HMH Books for Young Readers, 9780544668676, 288pp. Seventeen-year-old Vivian Apple never believed in the evangelical Church of America, unlike her recently devout parents. But when Vivian returns home the night after the supposed "Rapture," all that’s left of her parents are two holes in the roof. Suddenly, she doesn't know who or what to believe. With her best friend Harp and a mysterious ally, Peter, Vivian embarks on a desperate cross-country roadtrip through a paranoid and panic-stricken America to find answers. 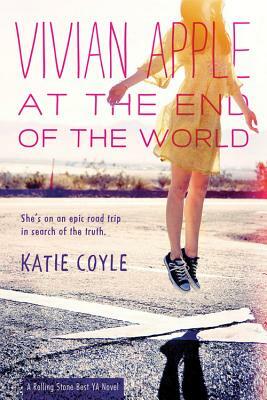 Because at the end of the world, Vivan Apple isn't looking for a savior. She's looking for the truth. Katie Coyle grew up in Fair Haven, New Jersey, and has an MFA from the University of Pittsburgh. Her short fiction has appeared in One Story, The Southeast Review, Cobalt, and Critical Quarterly.